Isaac C. Wilson and his wife Maxie established the funeral home in Church Hill, Tennessee in 1946. 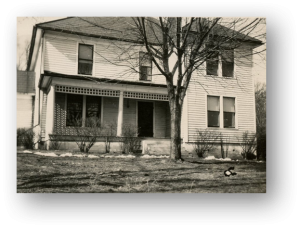 Mr. Wilson, World War II veteran, purchased the Dr. Powers’ Homeplace on Maple Street. Dr. Power’s Homeplace become a historical beacon to the community from the center point of location to the services provided. During this time, electricity was not available in the eastern Hawkins County parts, especially phone service. In mid-1947, Mr. Wilson acquired a phone service. His firm was the first business to have the modern telephone. September 12, 1951, Isaac obtained 120 new telephones for the Church Hill community. The business was a community message board, taking calls for the people in the community which provided the telephone usage to residents. In 1946 Wilson Funeral home also provided an ambulance service to the community. Maxie, Isaac’s wife, took the emergency calls, then drove the ambulance to Mr. Wilson who would continue to the hospital with a patient. The funeral home also led to be the meeting place for several Church Hill area churches in their early years. Wilson Funeral Home helped establish the city people recognize today as Church Hill. In 1960, H.L. Johnson joined Wilson Funeral Home while establishing his own roots in Church Hill. Mr. Johnson served in the Armed Forces and returned to the area to continue helping Mr. Wilson’s business grow. 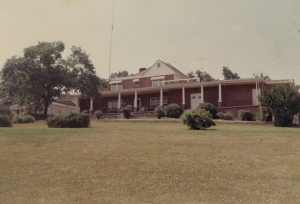 The two gentlemen organized Church Hill Rescue Squad, which was headquartered in the funeral home’s basement for several years until the operations were relocated and taken over in the 1960’s. Mr. Wilson retired in 1968 and Mr. Johnson purchased the funeral home. Mr. Wilson passed away in 1978, but his legacy continues. 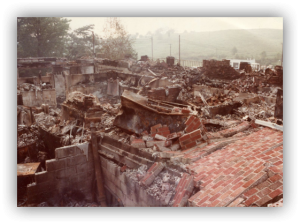 On August 27, 1982, the original Dr. Power’s home was destroyed by fire. The community pitched in and returned the assistance they had been given in previous years. Residents rallied around the remains of the funeral home and helped store caskets, cars, furniture, or other items they could salvage. Construction broke ground on the new facility to be named Johnson’s Funeral Home in 1982. The firm was completed in 1983. During a two day open house for the new facility more than 3,500 people toured the building. In 1986, Mr. Brian Arrowood came to the firm as Manager. He wanting to continue the legacy of Mr. Wilson and Mr. Johnson by serving the community of Church Hill. Brian and his wife Christy Lyons have always had a vision to serve the community. Christy joined Food City in 1999 as a pharmacist who is serving the community of Church Hill. Together, Brian and Christy have turned a vision into a reality. In 2014, Mr. Arrowood became a business partner at the funeral home. The funeral home’s name changed to Johnson-Arrowood Funeral Home. In 2018, Brian & Christy became owners of the funeral home. Today, Johnson-Arrowood Funeral Home sets on the hill as a reminder of the important pieces in Church Hill’s past to present. Johnson-Arrowood Funeral Home is the only remaining locally owned firm in Church Hill. The funeral home continues to help families in the time of need and providing the care each loved one deserves.